Thomas was born in 1892 in Polesworth, Warwickshire. The son of John and Mary Caldicott, nee Allsop, Thomas was the oldest of 6 children: Thomas, Ethel May, Mary, Charles, William Arthur and Emma. In the 1901 and 1911 census he is living in the family home in Gilsow, Coleshill and in the 1911 census Thomas was working alongside his father as a plate layer for the Midland Railway. Later that year, however, on 17th July 1911, Thomas joined the City of Birmingham Police. 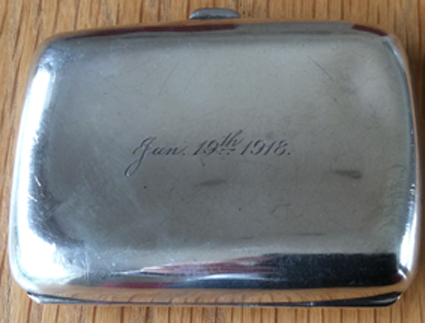 He served on the ‘E’ Division with warrant number 7865, collar number 167. He resigned on 15th November 1915 to join the army. In the middle of his training, in April 1916, Thomas married Dorothy Nurse at Gilson Hall. Thomas finished his training and went to France with the Coldstream Guards in December 1916. At 3.50 am on Tuesday 31st July 1917, the first day of the Battle of Pilckem Ridge, Thomas's battalion attacked towards Langermarck from the trenches situated just north east of Boesinghe, supporting 1st Battalion, Grenadier Guards and 1st Battalion, Welsh Guards. All initial objectives were taken with ease, with the supporting battalions taking over the advance at 7.15 am. Thomas's battalion then successfully took Fourche and Captain's Farms and consolidated the positions gained. From this time onwards rain fell without cessation for 4 days and nights effectively cancelling any further advances due to the ground being turned into a bog. 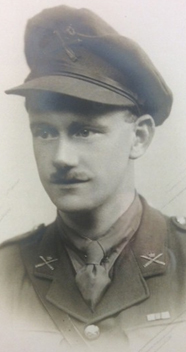 On the night of 5th/6th August Thomas and his platoon were leaving the front line trenches when a shell burst amongst them, severely injuring Thomas and several others. He was taken to Bleuet Farm dressing station, where he was confirmed dead. He was buried at Bleuet Farm Cemetary, near Ypres. Thomas's two younger brothers also served in the Coldstream Guards. Charles joined in June 1915 and was wounded and discharged in 1917, he died in 1977. William joined in November 1915 and served until he was discharged in 1919, he died in 1965. John was born in 1892 at Amblecote Stourbridge, to Richard and Sophia Clasper, to 10th of 13 children: Richard, Mary, Charles, Edward, George, Fanny, Margaret, Sophia, Mabel, John, Wilfred, Albert and Joseph. He was baptised, alongside his younger siblings Albert and Jospeh, at Holy Trinity Amblecote on 15/05/1902 when he was 10 years old The family resided at 24 Enville St, Stourbridge. John's father was a 'Gas House Retort builder' and the 1911 census shows that his brother, George, was also in this profession while John was in the related trade of brick maker. 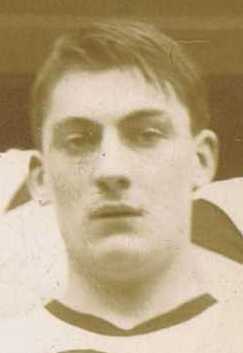 John joined Birmingham City Police on 17th December 1913, at the age of 21. He served on the ‘A’ Division, with Warrant number 8424 and his collar number was A39. He resigned on 21st May 1915 to join the Army and enlisted at Birmingham, being assigned to the Coldstream Guards, private 16162. Birmingham City Police records dated 20th November 1916 shows 5 ‘A’ Division Constables having been wounded including John CLASPER, however John recovered and returned to his regiment. The 1st December 1917 saw a Brigade attack on the Quentin Ridge and Gauche Wood, north of Epehy, France. The attack was led by 2nd Battalion Grenadier Guards and 3rd Battalion Coldstream Guards at 6.20 am, with John's battalion acting as support. The attack was to have been preceded by an advance of 20 tanks however these were late and arrived 10 mins after 'zero hour'. After being initially halted by machine gun fire, the leading battalions rushed Gauche Wood and managed to take the wood and fight off two counter attacks. All of the tanks assisting the attack were put out of action, however their crews brought up Lewis Guns which proved invaluable. The positions gained were consolidated but were found to be susceptible to enemy sniper and shell fire from Villers - Guislain, this causing many casualties in the battalions. Relief took place during the night. Casualties in John's battalion amounted to 30 men killed, including John Clasper, and 100 wounded. 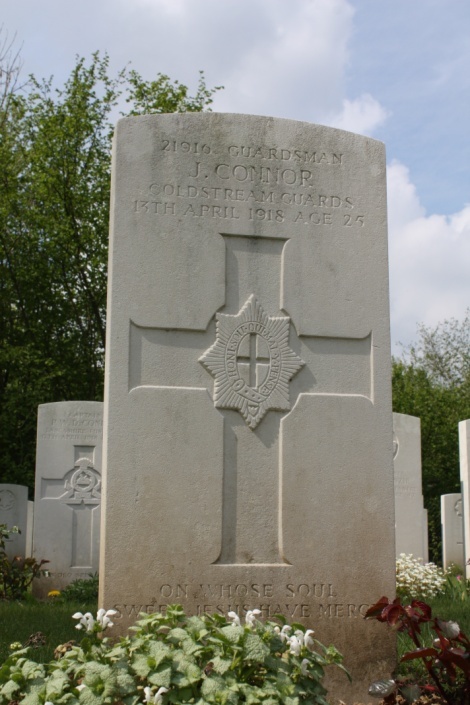 John's body was not recovered and he is commemorated on the Cambrai Memorial at Louverval. Walter Gordon Coates was born in Crumpsall, Lancaster in the first quarter of 1889. His Parents were Walter and Emma Coates, Nee Broughall, he also had an older brother, William, and a sister, Marguirite. Later that year the family must have fallen on hard times as the family were registered at Manchester Workhouse. The father’s profession is stated as a farm bailiff, but he was unemployed. By the 1901 census the family are lodging with another family in Littleover Derby. His older brother William is no longer with the family, but there is now a younger sister, Annie. By 1911 Walter has joined the army, serving in the 2nd Battalion of the Grenadier Guards and, at the time of leaving, was an Army Chef. On 6th October 1913 Walter joins the Birmingham City Police on E Division, warrant number 8337, but on the outbreak of war he is recalled to the colours and rejoins the 2nd Battalion Grenadier Guards, alongside his colleague from B Division, Horace Weedon. Horace becoming Private 14903 and Walter, Private 14909. Their battalion is immediately drafted to France aboard the SS Cawdor Castle, arriving at Le Havre on 13th August 1914. The battalion were in reserve at Mons, falling back with the BEF until they reached the Aisne. On 14th September, Walter and Horace’s battalion crossed the Aisne at Pont Arcy and advanced under shellfire to La Cour de Soupir Farm which they reached at 1030am. The Germans immediately attacked the the battalion’s positions but were repulsed. Heavy fighting continued throughout the remainder of the day with the battalion successfully defending the positions but at a cost of 500 men killed, missing or wounded. The following day the battalion dug defensive trenches and held the positions although continually attacked and shelled by the Germans until relieved on 17th September 1914. In the maelstrom of the battle, both Horace and Walter are killed and their bodies lost. A newspaper article quotes Walter's father saying Walter had been captured, but alas this does not appear to have been the case. Horace and Walter are both recorded as killed on 16th September 1914 and are commemorated on the La Ferte-sous-Jouarre Memorial, Seine-et-Marne. John Connor was born in Oldham in September 1884, son of Martin and Kate Connor, of 26 Mort St, Oldham, with two brothers, John and Charles, and two sisters, Mary(Polly?) and Annie. His father was a spindle maker and in 1911 John was living at home and was an apprentice clogger. John joined Birmingham City Police on 11th December 1914, he served on the ‘E’ Division, with warrant number 857 and his collar number was E260. He resigned 5 March 1917 to enlist as Private 21916, 3rd Battalion Coldstream Guards. After training John would have reached France in late 1917. With the German Spring Offensive, launched on 21st March 1918, in full swing, John's battalion was moved up to hold positions just north of Merville in the valley the Lys and stem the German advance. On 12th April 1918 the battalion took up defensive positions from I'Epinette to le Cornet Perdu. At first light the following morning the German artillery began bombarding the battalion's lines, this being followed at 8 am by an infantry attack which was beaten off. Orders were then given for the battalion to make an advance at 11 am. At the allotted time the battalion moved forward, being immediately hit by a cross fire of machine guns situated in houses in le Puresbecques and in an orchard south west of Vierhouck. In spite of numerous casualties the battalion made an advance of 400 yards where they dug in. At 4.30pm, after an artillery barrage, the Germans again attacked the battalion's lines but were again repulsed with huge loss of life. The positions gained were held overnight until they were relieved on 13th April. Casualties in the battalion amounted to 1 officer and 115 other ranks killed, including John, recorded as killed on 13th April. He is buried in Aval Wood Military Cemetery, Vieux-Berquin. Peter Crawley was born in Holbourn, Middlesex in 1888 to John and Marie Crawley. Peter had two older brothers, Dennis and Jeremiah, an older sister, Margaret, and a younger sister, Marie. Peter's father died when he was young and, by 1901, his mother was working as a Costermonger (Hawker) to provide for the family. Peter started working life as a newsvendor but, in 1905 at the age of seventeen, he joined the army, signing up for 6 years with the 7th Btn King's Royal Rifles. His Service number was 8750. 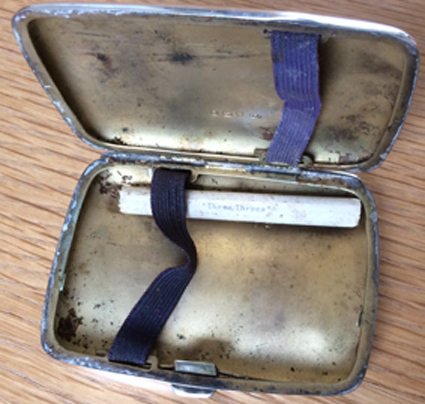 Upon leaving the army, Peter worked as a porter before joining Birmingham City Police on 19th May 1913. He served on the ‘E’ Division, his warrant number was 8317. 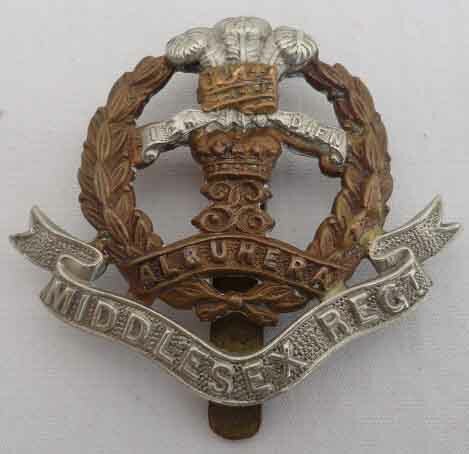 At the outbreak of war, Peter was recalled to the army, joining the 1st Middlesex Regiment, number L/10885 and arrived in France on 23rd November 1914. By mid-1915 Peter had been promoted to Corporal. Peter's battalion spent July and August 1915 either in billets in Gispot, near Steenwerck at Laventie or in the front line trenches in the Laventie sector. Relieved on Sunday 15th August 1915 by the 11th Battalion, King's Royal Rifle Corps, the battalion moved back to billets in the area of Vieux Berquin- Neuf Berquin-Doulieu and from here moved into billets at Annequin. Most of September 1915 was spent in training for the forthcoming Battle of Loos. On Thursday 23th September 1915 Peter's battalion relieved the 2nd Battalion, Royal Welsh Fusiliers, taking over trenches between the Vermelles-La Bassee railway and the Vermelles-La Bassee road. The battalion's objective on the first day of the attack was to assault and capture Railway Trench. At 5.50 am on the morning of Saturday 25th September 1915 the British released asphyxiating gas towards the Germans lines, however instead of drifting as desired it hung lifeless in the air or blew back to the British trenches from which it had been projected, in many places with disastrous effects. At 6.30 am the order to attack was given. 'A', 'B' and 'C' Companies of the battalion led the assault with the remaining 'D' Company acting as reserve. Almost immediately the battalion was cut down by German machine gun fire, the enemy gunners being unaffected by the gas. The War Diary merely records, "At 5.50am a gas attack was opened on the German trenches for 40 minutes. This was not, however successful, and did not have much effect. At 6.30 the battalion attacked with three Companies in the front line and one Company ('D') in reserve. The Battalion was all flung into the battle line, but failed to get further forward than 100 yards and were then hung up. Gunners again shelled the hostile line, but no further advance was made. At 12 noon the Battalion was ordered to withdraw to Brigade Reserve, having lost very heavily in both officers and men. A large proportion of N.C.O.s, were casualties." At 1.15 pm what was left of the battalion was ordered into reserve at Siding No.3 and Braddel Trench. A role call at this time mustered just 85 other ranks although others did return from the battlefield during the hours of darkness. Casualties for the day were 10 officers killed and 7 wounded, with 73 other ranks killed, 290 wounded, 66 missing 7 gassed and 2 suffering from shell concussion, a total of 445 men. Peter was one of the 290 wounded ORs and was transferred to a Casualty Clearing Station at Chocques, just North West of Bethune where he succumbed to his injuries on 27th September 1915. 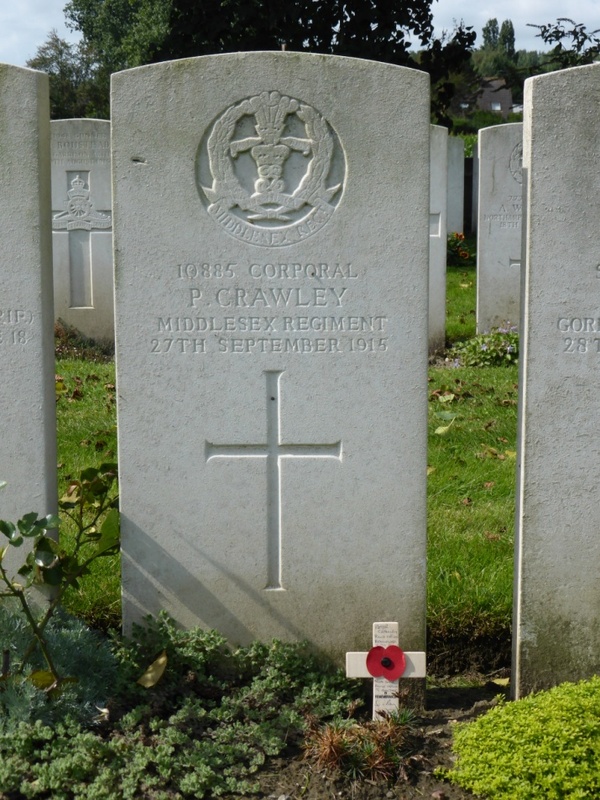 He is buried in Chocques Military Cemetary in the Pas-de-Calais. Arthur Croft was born on June 7th 1891 in Stone, Staffordshire and baptised at Christ Church in Stone. His parents were Benjamin and Mary J Croft, his father was a butcher. Arthur was the fifth of eight children: Martha, Alice, Elizabeth, Mary, Arthur, Thomas, John, James. In 1901 the family were living at 33 Old Road, Stone but by the 1911 census his father had died and the family were living at 5 Arthur Street in Stone, Arthur by this time was working as a wood sawyer. 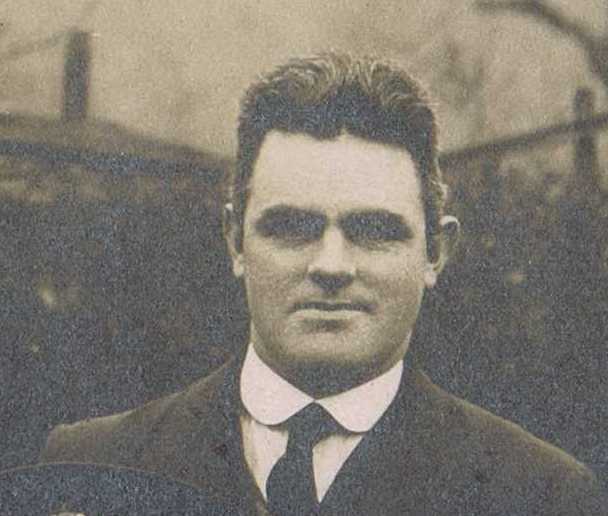 Arthur joined Birmingham City Police on 4th March 1912, serving on the ‘C’ Division, with warrant number 8195. His collar number was PC C 284. On 21st May 1915 he left the police to join the army, being assigned to 9th Battalion Royal Warwickshire Regiment, regimental number 12103. After training he entered the Balkan theatre of war on 11th December 1915. By November 1916 Arthur, now a Corporal, was in training at Amara following his battalion's abortive attempts to relieve Kut. On Friday 1st December 1916 the battalion commenced operations on the right bank of the Tigris River and, on Thursday 14th December 1916, seized a Turkish position on the Shatt-el-Hai. There followed a month of small engagements, during which the battalion fought its way to within 100 yards of the main Turkish lines. At 10.30 am on the 25th January 1917 the 9th Worcestershire and 7th North Staffordshire regiments attacked the enemy lines in the Hai Salient, seizing the positions which they then began to consolidate. When Turkish counter attacks threatened to drive these battalions back, Arthur's battalion was sent forward to assist. At noon the position became critical when the Turks recaptured a portion of their old lines held by the Worcester’s. Arthur's battalion attacked with fixed bayonets across open land and routed the Turks, re-establishing the line. During the afternoon the Turks continued their counter attacks and, at 3.15 pm, by sheer weight of numbers, forced the battalions to retire. Casualties in Arthur's battalion amounted to 5 officers killed and 7 wounded with 52 other ranks being killed, 118 wounded and 11 missing. Arthur is commemorated on the Basra memorial on Panel 9. Joseph Ison Cuffley was born on 19th January 1888 in Radford, Nottingham. He was baptised on 1 September 1889 in St Paul Hyson Green Radford, Nottingham and was the second child of Joseph and Fanny Cuffley. His father was a boot maker and in 1891 the family were living at 132 Noel Street, Radford, with Joseph's older sister, Alice Gertrude, and a younger sister Francie Beatrice. By 1901 the family had moved to 111 Burford Road Nottingham and Joseph was working in the printing trade, as a guillotine cutter. By 1911 Joseph had left home and was boarding with Mr & Mrs Ponberth at 2 Weston Cottages, Prospect Street, Nottingham, however he moved to Birmingham and joined the Birmingham City Police on 17th July 1911, eventually moving to 38 Hampton Court Road, Harborne and worked out of Harborne Police Station. His warrant number was 7867, collar number 105 on B Division. By 1915 Joseph was living with Alice Mary Matthews, at the house in Hampton Court Road and on 15th November 1915 Joseph resigned to join the army. After initial training he joined 3rd Battalion Royal Welsh Fusiliers as Acting Corporal, 36729, but on 25th January 1917 he transferred as Temporary 2nd Lieutenant to the Machine Gun Corps. On 8th March 1917 Joseph went to France with the 61st Battalion Machine Gun Corps (Infantry). Joseph presumably came home on leave in November/December 1917 as, by early March 1918, Alice was three months pregnant and Joseph came back to Birmingham and the couple got married at Kings Norton, before immediately returning to France! 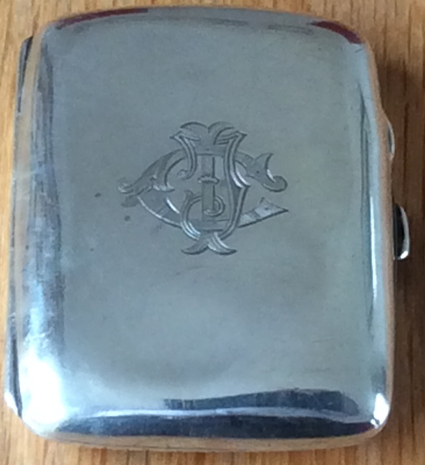 For Joseph's 30th birthday, in January 1918, he was given a silver cigarette case, which remains with the family, images below. 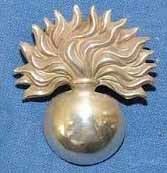 "For conspicuous gallantry and devotion to duty On the enemy gaining a footing in one of our trenches he at once organised and led a party and ejected the enemy. He later went in search of ammunition and delivered it across ground, heavily swept by machine gun fire to two machine guns whose supply had run out. Throughout the attack he displayed great courage and marked energy." 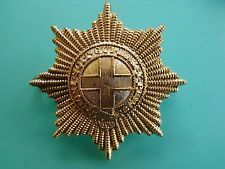 Joseph was being treated for his injuries at Dury, possibly 48th CCS, between Arras and Cambrai, when the German Spring Offensive swept through, capturing the whole area and Joseph fell into German hands. He subsequently died of his wounds on 31st March 1918 and it is likely he was one of five British dead buried originally in Dury Churchyard. After the war his remains were then moved to the Commonwealth War Graves Cemetary at Grand Seraucourt. 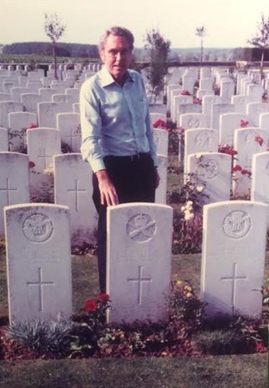 On the right is a touching photograph of Joseph Ison Cuffley’s son, Joseph Lynn Cuffley, at the grave of the father he never knew, as his father died six months before his birth.